Polite courteous service with somewhere to wait while the car is worked on. We will establish that the car is alignable - i.e. a pre alignment check. The detail of this check may be model specific, but would ensure that any worn steering or suspension components are identified (See Note 1). Note 1: Recommendation - do not drive some distance to us when you know that there are worn suspension parts present. Under this situation ring and discuss the position, we may be able to do these pre alignment repairs. It may be recommended that you get suspension remedial work (loose wheel bearings, worn anti-rollbar bushes, worn ball joints or trackrod ends etc.) replaced locally first. 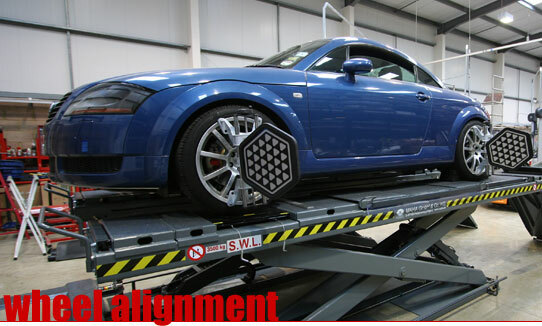 Then go to have the suspension/alignment set up on the Hunter aligner. A full four-wheel measurement and adjustment of front individual toe thus straightening the steering wheel (See Note 2). Diagnosis of all angles and presentation of a 'Before' printout. Highlighting problems with the customer thus agreeing additional costs (i.e. amount per hour, or cost per camber adjustment etc.) to carry out the work and do the adjustments. To be given an 'After' adjustments printout. Note 2: Where the car has the steering rack incorrectly connected to the steering column or the steering wheel has been removed and incorrectly positioned previously would involve an additional charge. Where the toe adjusters are not serviceable - i.e. corroded solid then new parts may need fitting - additional charge.